Wash the potatoes. Peel and diced them into smaller pieces. Place the potatoes in boiling water and cook for 20-25 minutes or until the potatoes are soft. Roast the garlic cloves in olive oil for 15 minutes in medium heat and drain the oil. Transfer the potatoes and garlic to a bowl. Mash with a fork and add butter, milk, salt and pepper. Clean and peel the beet. Try to round the sides. Slice thin with a mandolin. Dip them in flour and fry them in olive oil 1 min each sides in medium heat. Set them aside on a paper towel. Using a sharp knife, score the duck breasts with 3 long cuts, diagonally. Repeat crossways to form a grid pattern. Season on both sides with salt and pepper.4. Place a frying pan on a medium heat, immediately add the duck breasts, skin side down, and after 2 minutes turn the heat down to low. Continue to cook for 10–15 minutes or until the skin is crisp. Increase the heat to medium and turn over the duck breasts. Cook for 4–6 minutes, depending on the thickness of the breasts and how cooked you like the duck, then turn off the heat and allow to rest for a few minutes before serving.5. Meanwhile, make the sauce. Add 2–3 tablespoons of the duck fat to a frying pan and place on a medium heat. Tip in the shallots and cook for 5 minutes or until softened but not browned, then stir in the jelly and vinegar. Allow to bubble and reduce for 3–5 minutes or until the mixture is syrupy in consistency. Season with salt and pepper to taste. Diced small the chives and garlic and mix with the goat cheese, salt and pepper. Cut the figs half way and add the seasoned goat cheese in the middle. Bake for 5 min.7. Place the mash potatoes on the plate with the beet on top. 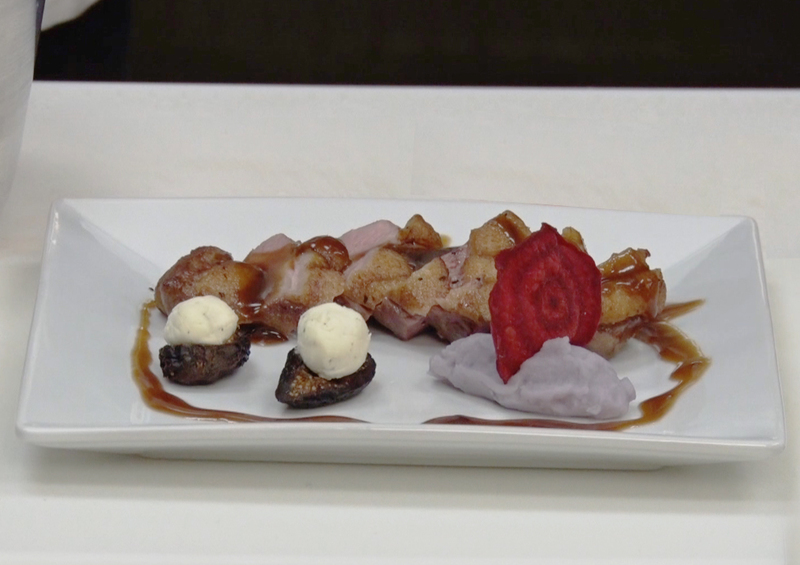 Add the stuffed fig and slice the duck breast and drizzled with the sauce. Garnish with fresh red currant and thyme. Whisk eggs, sugar and salt in large bowl. Gradually whisk in flour, then 1 1/4 cups milk. Strain into medium bowl. Heat an 8-inch diameter nonstick pan over medium-high heat. Brush with melted butter. Pour 3 tablespoons batter into skillet and swirl to coat bottom evenly. Cook until top appears dry, about 45 seconds. Turn and cook until brown spots appear on second side, about 30 seconds. Turn crêpe out onto plate. Repeat with remaining batter, brushing skillet with butter and stacking crepes on plate. Remove husks and silk from the fresh ear of corn. Blanch the corn in boiling water for 5 minutes and drain it. Holding the stem end, cut downwards through two or three rows of kernels with a sturdy, sharp knife. Repeat until all kernels are removed. In a sauté pan add the corn kernels, chopped garlic, salt and pepper and deglaze with white wine and boil until liquid evaporates, about 1 minute. Melt butter in large saucepan over medium heat. Add some finely chopped garlic and stirred until lightly brown. Incorporate the chopped tarragon and a pinch of the dried lavender flower. Add the heavy cream and season with salt and pepper. Cut the St. André in 4 equal slices and remove the outside skin of the cheese. 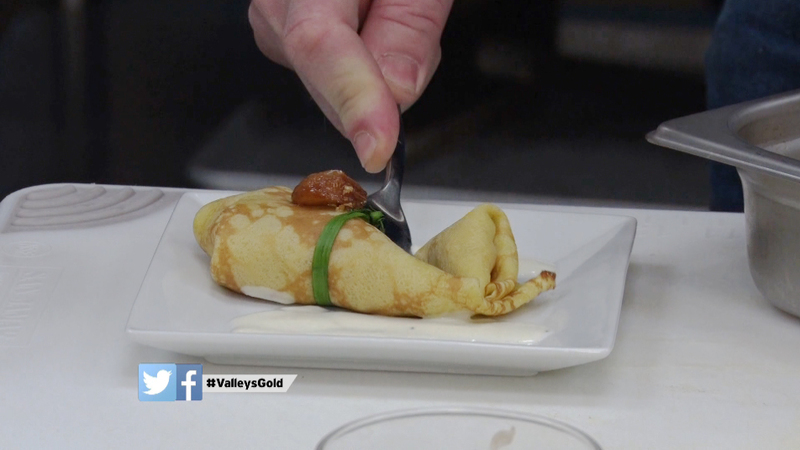 Fill each crêpe with the corn mixture and 1 slice of the St. André. Wrap the crêpe and tie the top with the chive. When finished bake the stuffed crêpe in the oven at medium heat for 5 minutes to let the cheese melt. Add the tarragon lavender cream sauce in the bottom of the plate, place the stuffed crepe above the sauce and garnish with fresh lavender and tarragon leaves.